You'll be £4.99 closer to your next £10.00 credit when you purchase Scottish Lion on Patrol. What's this? This is a fascinating acount of the 15th Scottish Reconnaissance Regiment. They played a key role in the liberation of Europe and the Regiment was unique in that it was in the forefront of the crossings of the Rivers Seine, Rhine and Elbe. The troops who landed in Normandy were highly trained but most of them had not experienced actual combat; however they quickly learnt the skills necessary to survive and defeat a cunning and resourceful foe. Scottish Lion on Patrol was first published in 1950. This new edition has been written by Tim Chamberlin who, being closely involved with the Old Comrades Association, has had rare access to veterans' memories. Full of eye-witness accounts, this is a true story of a real 'Band of Brothers', the original work being faithfully reproduced and significant new material from personal recollections which are graphic, moving and occasionally humorous. As Major General Peter Grant Peterkin says in his new foreword, 'His interviews with those who fought bravely with the Regiment have brought a fresh and well-informed insight into the story. Reconnaissance regiments play an exciting and dangerous role venturing out in advance of the main bodies of troops and armour to determine where the enemy is positioned and the best ways forward. This book should have wide appeal to those interested in the actions and engagements of a fine reconnaissance regiment that was in the thick of it as Monty’s forces fought their way from Normandy through France and Holland and across the Rhine to Germany itself. I’ve read the original and I’m sure that the authors of the 1950 edition, Walter Kemsley and Mike Riesco, would be very proud of this new edition. The additional material, painstakingly gathered by Tim Chamberlin, includes many pictures and personal anecdotes which significantly increase the interest and pleasure in reading the distinguished story of the 15th Recce. Walter Kemsley was a trained journalist as well as being Signals Officer of the 15th Recce throughout the fighting. Tim Chamberlin, as historian and long-serving Secretary of the 15th Reconnaissance Regiment Association, has a done great job in producing this superb revised edition. Scottish Lion was first published in 1950, this new edition has been written by Tim Chamberlain who because of his links to to the 15th Old Comrades Association has been able with the help of veterans memories and papers add new material to this unit history. The story details the regiments key role in the liberation of Europe and of having the distinction of being in the forefront of operations in crossing the Rivers Seine, Rhine and Elbe during that campaign in North Western Europe. The troops who landed in Normandy were highly trained but were not combat experienced but quickly learnt the necessary skills to survive some of the hardest fought battles of the second world war in NWE. It is also a fascinating insight into the daily activities and role of a Reconnaissance Regiment during WW2. A fasinating read for all world war 2 enthusiasts. As the long standing Secretary of the Old Comrades Association, Tim Chamberlin, has spent many, many hours in the company of the men who served together from the Normandy beaches to the Baltic in the 15th (Scottish) Reconnaissance Regiment. He is therefore uniquely well placed to incorporate the many personal accounts and photographs he has gathered over the years into a revised edition of the history of the Regiment which was originally published in 1950; now long out of print and virtually unobtainable. The result is a vivid, highly personalised and thoroughly readable account of the Regiment at war which most effectively blends new material with the original account. “Only the enemy in front every other beggar behind!” the unofficial motto of the Corps accurately describes their role in providing the “eyes and ears” for infantry formations and, as such, the very significant contribution they made in all theatres of war. The 15th(Scottish) Reconnaissance Battalion, were raised in February 1943 in Northumberland, as part of the new Reconnaissance Corps formed as a consequence of the lessons learned from the BEF when the lack of highly mobile, lightly armoured reconnaissance capability was identified as a major tactical weakness. The men who served in the Battalion, re-named Regiment in 1944, were a rich mix of men from the Scottish infantry, Londoners from the Royal Fusiliers and men from the Royal West Kent’s. The Regiment played a significant part in the campaign in North West Europe and this is reflected in their casualty figures and awards for gallantry and distinguished service. Seven officers and sixty six other ranks were lost in action and, of the many awards received, both Commanding Officer’s received the DSO, twelve officer’s the MC, two other ranks were awarded the DCM and fourteen the MM. “Scottish Lion on Patrol” provides a comprehensive and very readable account of the Regiment from formation through 316 days in action across Europe, to disbandment. The text is enhanced by hundreds of names, fascinating personal accounts, clear sketch maps and well over 400 photographs and is supported by appendices with rolls of honour, honours and awards, obituaries, grave locations, maps and a list of the original members of the old comrades association. The original (1950) is virtually impossible to find so I was pleased to be able to read it at last. The new information follows on each chapter and the photographs are most interesting , I particularly like the one Of F.M. Montgomery pinning the DSO on 'Tiny' Barber at 6'8" the tallest General in the British Army. Some of the information is harrowing and some amusing but at least it is factual and from the men who were there. Excellent cemetery location details. A must for anyone with an interest in the campaign from Normandy to the Baltic. 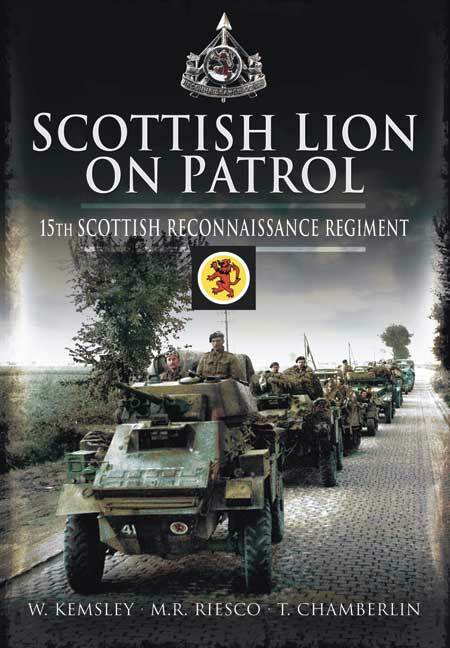 I read Scottish Lion on Patrol knowing nothing about the 15th Scottish Reconnaisance Regiment, but with a reasonable knowledge of how the Army operates, the campaign from Normandy to the Baltic, and the purpose and need for armed reconnaissance in modern warfare. Opening the first page of a regimental history is like barging into someone’s home without permission. You are a stranger. If you have had any experience of service in a military unit, you hope gradually to become absorbed in these new surroundings. But you will only do so if the authors, three in this case, allow you to share immediately in the experience of creating a fighting unit with all its intangible assets. Abstract features like character, humour, courage, esprit de corps are not best recorded in so many words, but emerge as you read on. And ‘reading on’ is inescapable in this gripping story. So many regimental histories get bogged down in detail – essential to the battle plan at the time, but impossible to grasp and visualise in the written record. The writing of Scottish Lion is never stuck in too much detail, which is only appropriate for a nimble recce regiment! veterans of the Regiment has given not only even more authenticity to the account, but also much evidence of real courage, wit, humour and instinctive intelligence (well beyond good training) to the record. This is the most exceptional story of a proud and outstanding regiment, and it will rightly take its place among the vast bibliography of the war from 1943-1945 as a brilliant example of what we do best. Tim Chamberlin, who has written the revised version, has retired from a long career in sales and marketing. He is an historian with a special interest in Gallipoli and Bomber Command. As Secretary of the 15th Scottish Regimental Association for many years, he learned much about their activities during the war and felt compelled to ensure that the full story be told.